When the Trump administration announced temporary waivers to sanctions on Iran’s oil last week, officials cited concerns about global oil price spikes. The more cautious approach appears to have given oil markets a reprieve, but the Organization of Petroleum Exporting Countries (OPEC) may consider a new round of production cuts when it meets in Abu Dhabi on November 11th. Central to decision making for both U. S. leaders and OPEC ministers is a debate over the signs of distress in major emerging markets. Expectations for the price of oil in 2019 are particularly scattered with predictions ranging between $65 and $100 per barrel. The $100 camp focuses mainly on tail risks to oil supply, including disruptions involving the Iran sanctions, continuing loss of production in Venezuela, and questions over Saudi and Russian output. However, oil is also experiencing negative contagion effects from other markets, especially indicators of financial vulnerability in emerging economies. Severe currency devaluation threatens sustained oil consumption in some of the most rapidly developing markets, prompting some analysts to predict that the current downward move could become more permanent. Paradoxically, any sudden upwards movement in oil prices could stimulate their eventual collapse by pushing weakened economies over the edge. 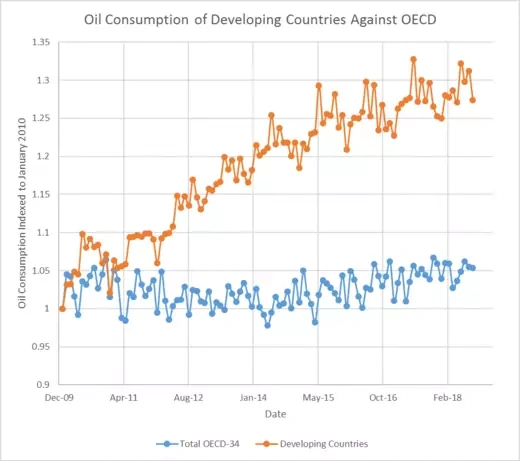 Structurally, technology and efficiency gains in the countries of the Organization for Economic Cooperation and Development (OECD) have been flattening oil consumption in recent years. But global oil demand has been supported by rapid growth in emerging markets. For example, China, India, Russia, Brazil, Turkey, Argentina, and South Africa are some of the largest sources of growth in the world. Together, their consumption has grown about 16% in the past five years. Figure 1 demonstrates the magnitude of growth in developing countries as compared to the OECD. Figure 1: OECD oil consumption growth compared to developing countries. The values are indexed to January 2010. The chart demonstrates the flat consumption rates of developed countries. Now, after years of remarkable growth, these economies are experiencing tougher times, as manifested by ongoing currency and inflationary pressure, tightening monetary policy, and U.S. inspired trade wars. U.S. tariffs against Turkey, followed by Turkish retaliation, have stymied the flow of U.S. dollars into the Turkish economy. 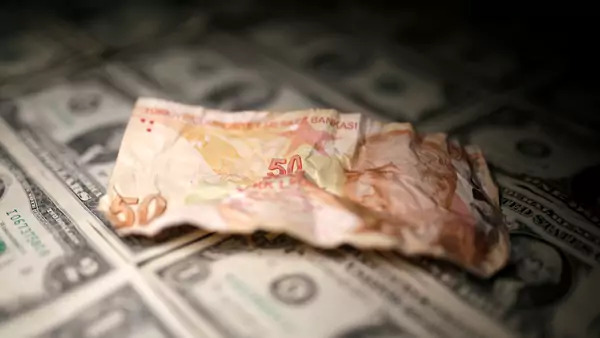 Without strong currencies supporting the lira, it sank nearly 40 percent against the dollar in just 8 months. But, Turkey was not the only country to see economic problems and the dollar rise affect its currency. Argentina’s peso has also fallen more than 45 percent versus the U.S. dollar in 2018 after the United States Federal Reserve raised interest rates and the country moved to dollar-defined assets. So far this year the South African rand, Russian ruble, Brazilian real, and Chinese yuan each fell more than 9 percent against the dollar. As the U.S. dollar has risen compared to a mix of standard international currencies, oil has risen in effective price because oil is priced in dollars on the international market. Emerging market countries have been hit not only by the nominally higher price of oil, but also by lower value currency with which to purchase it. With significantly more expensive energy, some analysts are predicting a slowdown in the oil market. At a minimum, it will drive affected countries to find ways to reduce oil consumption until their currencies stabilize, hence the sentiment of slowing oil demand as we enter 2019. These seven countries mentioned above account for more than one-fifth of the world’s oil consumption. While changes to demand from currency devaluation has been small so far, rising interest rates in some of the same countries could slow new investment, thus creating concern about recessionary pressure. South Africa’s economy is already succumbing to harder economic times. Turkey’s geopolitical ally, Qatar, has attempted to mitigate a recession with a pledge of $15 billion in direct investment into Turkey’s financial markets and banks. Now all eyes are on China and India, which appear to be posting slower economic growth than expected. The global oil industry has weathered emerging market crises in the past. Thailand saw swift growth in the early 1990s owing to foreign direct investment, but then experienced a sharp economic setback when the United States raised interest rates in 1997. A shortfall of foreign currency at that time forced Thailand’s government to float the exchange rate of the baht, which dropped nearly 40% in value against the U.S. dollar to which it was once pegged. Aptly dubbed “The Asian Flu,” Thailand’s currency crisis spread to Singapore, Malaysia, Indonesia, the Philippines, and eventually China and Japan. Slumping Asian currencies began to impact regional stock markets, bringing about a full-blown Asian recession and accompanying slowdowns in oil consumption. Between 1997 and 1998, Asian oil consumption fell by 1.9%, a dramatic reversal from extraordinary growth of 4.5% between 1996 and 1997. China’s oil use fell by 0.3% in 1998, a sharp reduction from its prior growth rate of 11.5%. The sudden drop in Asian demand sunk the price of oil as low as $10 a barrel. Evidence of easing oil demand growth has started to gain attention in recent months. Figure 2 shows the relatively flat to declining oil demand trends for China, India, and South Africa. Brazil’s trends have been more volatile due to worker strikes last spring that included work stoppages by truckers. Notably, oil use growth in China has moderated this year, partly due to advancements in energy efficiency and also possibly a signal that economic growth has been slower than recognized. India saw big consumption growth earlier in the year, but it has fallen off as oil prices have risen. These trends call into question the wisdom of assuming that growth in emerging markets will continue to drive oil prices into 2019-2020. 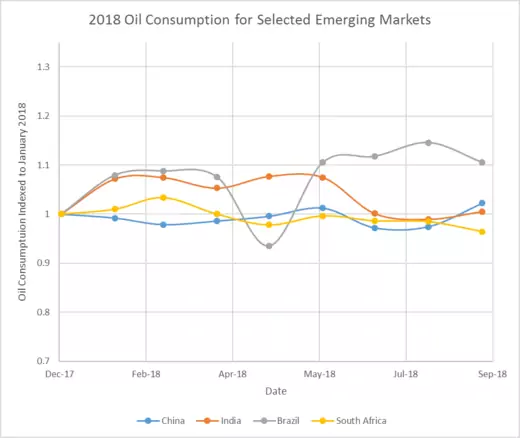 Figure 2: 2018 Oil Consumption Indexed to January of 2018. The plot shows relatively flat trends across China, India, and South Africa. All of this means that predicting oil prices for next year may be more of a dice roll than usual. Countries must walk a tightrope in terms of trade policy, monetary policy and oil production for major oil exporting countries. Any misstep could trigger further economic deterioration and that, as the announcement of the start of U.S. sanctions on Iranian oil exports demonstrated, is constraining choices.